Urban spaces are melting pots. These places are objects of survival; an aspiration for the future is nuanced in everyday existence. The sights, sounds and the stark reality is surreal is every way, that one might confront the naked brutality of these interstial voids amongst lattices looking down on them. Jean Braudillard’s ‘Simulacra and Simulation’ and its characterisation of the proverbial ‘Desert of The Real’ is the primary intellectual imagery which comes to my mind. The poverty and its depravation-destitution is numbing although there might be a satellite TV desktop box in the box. No clean water but a Dish TV, the reality of everyday living in subaltern urban India it’s paradoxical at best- aspiration and destitution co-exist on both sides of the page. Bhimnagar-Bhatpada is urban slum areas in Mumbai; nested between Saki Naka and Ghatkoper East in Mumbai. On top of a hill, easily visible to the airplane landing at the international terminal via its characteristic blue tarpaulins. 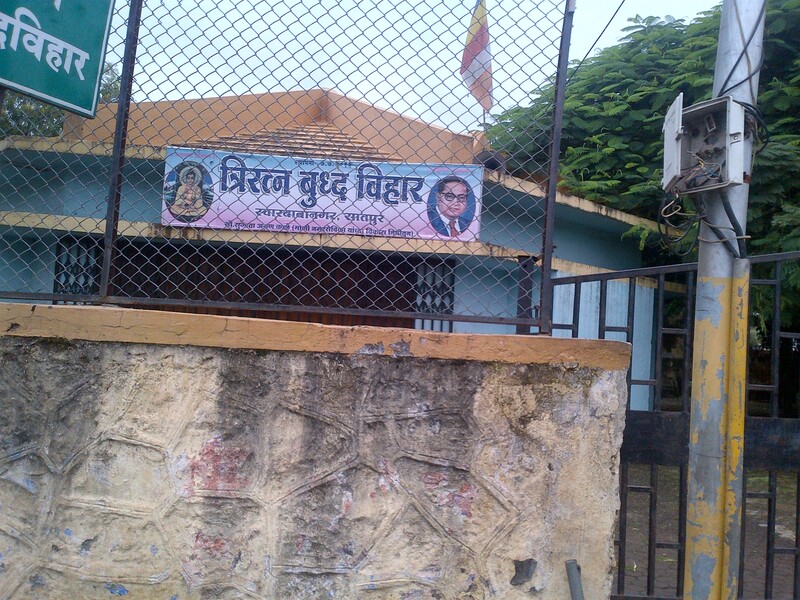 These communities are characterised by its neo Buddhist symbolism- the shrine dedicated to Ambedkar and Buddha as differentiators from their marginalised history. The motor-cycle is as much taken care of as the sacred cow. Capitalism is a great social leveller as caste melts away in the face of cash, as Dalit Scholar Chandrabhan would quip. Public Toilets are social intersecting areas for building social capital. The early morning loo call is a social event as much as an intimate one. The mainstream political parties such as the Republican Party of India and the Bahujan Samaj Party; who claim to represent subaltern voices in the power structures of democracy have made their presence felt by the signages. I am not very sure if representation in democratic structures makes for real empowerment on the ground. It does on the other hand certainly present an opportunity as a social insurance against caste based discrimination. Often as the case in democracy it’s often the choice between the devil and the deep sea. The Satpur Village adjacent to Satpur MIDC (an Industrial Zone) in the Nashik District of Maharashtra State in India is another example of the subaltern, social have-nots being collectivized and forging an alternate identity as a tool of resistance. Again out here Neo-Buddhist Imagery dominates the social mindscape. Subaltern communities are a crucial underbelly of urban capitalism as a manpower provider and a ‘Bottom of the Pyramid’ consumer base. That is the salvation of the market as when the politics does not deliver, the invisible hand does.